Gallery: A summer party for 250 in the lush Devon countryside. Fine dining for large numbers. 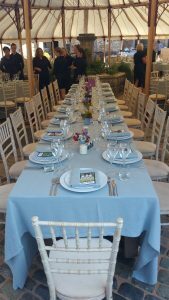 Whether you have a field or a barn, a garden or a boat, a large party, a corporate event or a small group of friends, whether you want an intimate dinner, a beautiful wedding or a wild hooley, myself and my team can come to you, wherever you are and help you create an event to remember. Please see the menu section or contact me for suggestions. See the gallery for pictures from the latest party, lobster dinner for 250.